The sight of demure, fashionably dressed young Chinese women queuing outside department stores in every large city in Europe (including Dublin), so that they can hand over a small fortune for a handbag, is not the eye-catching spectacle now that it was a few years ago. But for me, the willingness to hand over a month’s pay for a leather satchel in which to keep the car keys is one of the world’s great unsolved mysteries. However, what is currently happening at British luxury goods company Burberry may help throw some light on the arcane qualities of a ‘good bag’. While it has been around for 160 years and its trademark check fabric has been famous for a century, Burberry has been a luxury brand group for a lot shorter time. It still concentrates on check tartan outerwear, but its luxury range includes perfumes, watches, eye wear and leather handbags. The group has over 400 stores worldwide, half in emerging markets. In its recent management shake-up, the group lost CEO and creative chief Christopher Bailey, who was replaced by two ex-Givenchy Italians, Marco Gobbetti as CEO and Ricardo Tisci as chief creative officer. It has also seen the arrival as chairman of Irishman Gerry Murphy, once the MD at Greencore. In recent years, Burberry has toiled. Gobbetti’s solution is to take its brands further upmarket. He aims to increase its exposure to leather goods, rationlising store space, investing in technology and reducing costs. His moving into leather goods has attracted some attention as it seeks to turn the company known for its outer wear into a broad luxury brand. The group underlined its strategy by acquiring CF&P, an existing Italian leather supplier. Selling more bags is part of its plan for a number of reasons. They offer higher margins, require less selling space and no changing rooms. In Burberry’s case, leather goods account for only one-fifth of its sales, less than its competitors, Gucci, Louis Vuitton and Hermes. The coming years will see store reductions but Gobbetti also plans to spend £50m (€57m) in upgrading his shops. The group is embracing technology, having struck a deal with online fashion retailer Farfetch as a one-stop shop for its high-end brands in South East Asia. Investors are aware that changes in design can be risky but realise it takes more than high prices to become a luxury brand. There is some encouragement in the recent performance at Gucci. When Gobbetti announced his move upmarket, some investors were alarmed and the share price dropped. They have recovered and today the share price is £21.18, up 50pc on the year with an elevated price-earnings multiple of 25 and a market value of £9bn. 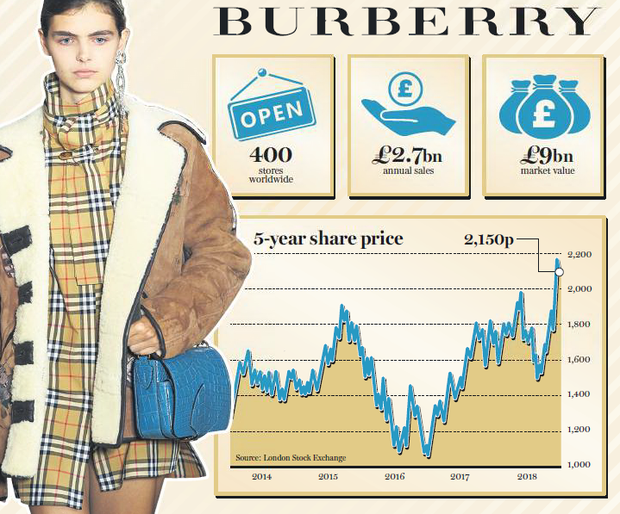 Last year, Burberry sales were down 1pc to £2.7bn but pre-tax profits grew 5pc and its operating margins at 15pc were £460m. Investors were happy that dividends were up to 41p a share and pleased the group is planning a share buyback. Things, of course, don’t always go smoothly. Management confidence was shaken when Belgian billionaire Albert Frere dumped his 7pc stake after only 15 months. The sale reignited doubts as to Burberry’s new strategy and its shares fell on the news. However the disposal by Frere, who also owns substantial stakes in Adidas and Pernod Ricard, was explained as a “portfolio adjustment”. Up to recently, luxury groups sold the majority of their products through traditional outlets like department stores, concessionary stores and wholesalers. This is about to change as the inexorable shift to the web takes place, the preferred marketplace for the young. In future, the luxury goods industry will have new distribution agreements selling through the internet. The prospect of the brands widening their distributions by forming strategic alliances with third-party online operators will be an interesting one to watch. How Burberry fares in this new regime will tell an important story. And while the luxury sector is crowded, fashion is all about weaving a new narrative. Has the Celtic Phoenix already passed its peak?